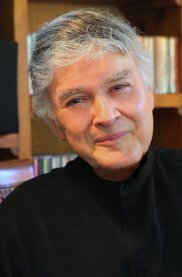 Robert Xavier Rodríguez was born on June 28, 1946 in San Antonio, Texas, where he received his earliest training in piano and harmony. Subsequent musical education included study in composition with Hunter Johnson, Halsey Stevens, Jacob Druckman, and Nadia Boulanger. He gained international recognition in 1971 when awarded the Prix de Composition Musicale Prince Pierre de Monaco by Prince Rainier and Princess Grace at the Palais Princier in Monte Carlo. Other honors include the Prix Lili Boulanger, a Guggenheim Fellowship, four National Endowment for the Arts grants, and the Goddard Lieberson Award from the American Academy and Institute of Arts and Letters. Rodríguez's music embraces all genres and often combines Medieval, Renaissance, and Baroque techniques with ethnic and contemporary materials. He has had particular success with his operas. His most recent, the one-act comedy La Curandera, has been produced in Colorado, California, and Texas. Frida, based on the life of Mexican artist Frida Kahlo, had acclaimed productions at the American Music Theatre Festival, The American Repertory Theatre in Boston, the Brooklyn Academy's Next Wave Festival, Vienna Schauspielhaus, Theater Nordhausen in Germany, Mexico’s Jalisco Filharmonica, and the Houston Grand Opera. Rodríguez's children's opera Monkey See, Monkey Do is one of the most frequently performed contemporary operas in the United States, with over 2000 performances to date.